Summer is just around the corner, and weddings are in the air. Well two weddings in particular. And there is no wedding quite like a royal wedding. By the time this magazine hits the news-stands the first, the big one, will already have taken place. We will have had time to ooh and aah, to dissect and discuss. But as I write this it is all speculation. Which of the world’s finest dressmaker’s will clad Kate for her biggest day ever? Which of the world’s most splendiferous cake makers will be deemed top dog? And what scrumptious confection will the royal couple plump for? For my part, summertime, England and wedding season calls for something a little more refined than the full on comfort cake eating of winter. Even if it is only to celebrate with from the comfort of my own tea-table. Hence tarts rather than a cake this time. Well, that and THAT quote. I had to make tarts for the queen of William’s heart. I am a passionate advocate of making pastry. Ever since I discovered how much it loves the freezer. Basically you make dough and get it to the point when you have filled a tart case with it, then rest it in the freezer until you need it. In the freezer! Which means you could plan to make a tart for a party next month and do it today, just because you have time today. It then become one of those glorious kitchen jobs that you can do when it suits you, when you find you can spend an hour or so unhurriedly weighing and mixing, rolling and waiting. You do need a little time, you do need to bear in mind a few simple ideas for a good result. That makes it sound like hard work, which isn’t the case. And remember that pastry needs to rest, and when it does you can too. And it is so fantastically useful to have the makings of a really special pudding (or for that matter a quiche or the like if you make a shortcrust) just to hand, half made already. For that reason I never only make enough pastry to fill one case. I make multiples so I have a little cache ready for culinary action. I urge you to do the same. One word of caution, if you do this then remember to label what they are. I did once make a smoked haddock quiche in a pate sucree shell! Interesting, but not quite the taste sensation I had been intending! So, what type of tart for the Queen of Hearts, for England in the summer? No contest in my book I am afraid. It has to be strawberry. I can get very excited about the perfect lemon tart. And most of the year nothing knocks a serious dark chocolate number off my top spot. But nothing speaks of the English summer to me like strawberries, even if it weren’t for Wimbledon, Henley, and the like. I have a June birthday and my mother called me her strawberry girl. 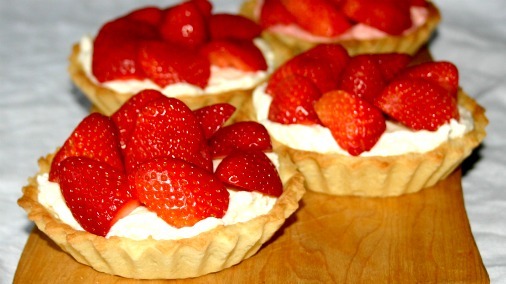 I always had strawberry tarts instead of birthday cakes. And you did not hear a whisper of complaint from me! So this ones for my Mum, who I have made pastry with many times and who incidentally helped me with this recipe. This will make one large 25-28cm tart or eight small 10cm tarts. Start by making the pastry, as I mentioned it is possible to do this way ahead of time. You can make this pastry by hand, it is however simpler in a food processor. Cream together the butter, sugar and salt. The butter needs to be firm rather than soft, but preferably not straight from the fridge. Then pulse in the flour until the mixture resembles fine crumbs. Then add the yolks and pulse again lightly, until just mixed in. Next add and pulse in the milk bit by bit. It is important not to overmix or overwork the dough here. Do not wait until the dough forms into a ball in the machine. When it looks like it would come together if you squashed it by hand, then stop mixing. Turn it out onto a floured surface and push and pat it into a flat disc without kneading. You want to keep handling to a minimum. The less you do, the lighter and flakier it will be. Wrap your flat disc of dough in Clingfilm and rest in the fridge for at least 20 minutes. Once chilled, roll it out and fill your tart tin or tins without pulling, letting it down into the tin. Trim to fit. This is when it must rest again, in the tin, in the fridge or freezer. If it is going in the freezer cover it lightly to set, then once frozen you can wrap it more robustly. When you are ready to make your tarts you need to bake the pastry cases. The filling is not baked, so this is all the cooking you will do. The baked cases need to be cold before you can anoint them with the strawberry filling, so you can do this earlier on the day you plan to eat them. Preheat the oven to 180C. Fill the pastry cases straight from the freezer with a disc of baking parchment and some baking beans to keep the case from puffing up. Bake for 10-15 minutes, until they are beginning to go golden at the edges. Take out the beans and bake a little longer to ensure the centre is also cooked. It is done when the pastry feels sandy to the touch. To make the filling put the cream cheese in a bowl and loosen it by whisking in the lemon juice. Then add the sugar and mix that in thoroughly. Lightly whisk the cream in a separate bowl and then fold gently but thoroughly into the cream cheese mixture. Use this to fill the cooled cases. Trim the strawberries and cut in half, then arrange on top of the cream filling. Voila, a tart worthy of the most romantic summertime feast! Sometimes it isn’t possible to get strawberries that are truly full of flavour. If this is the case, or if you just want to ramp up the strawberry factor there are two wonderful products made by Squires Kitchen that work very well in this recipe. Using SK Strawberry Real Fruit Fondant instead of the icing sugar adds a strawberry hint to the cream filling (use 5tbspns, same as for the plain sugar). Or adding the brand new SK Strawberry Real Fruit Powder in addition to the sugar, one tbspn for every one of sugar that you use creates a fully strawberry flavoured cream filling that is also wonderful. 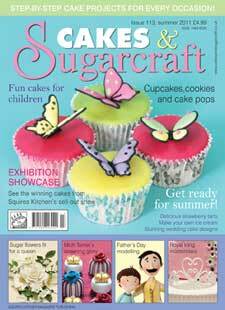 This article first appeared in Cakes & Sugarcraft Magazine issue 113.